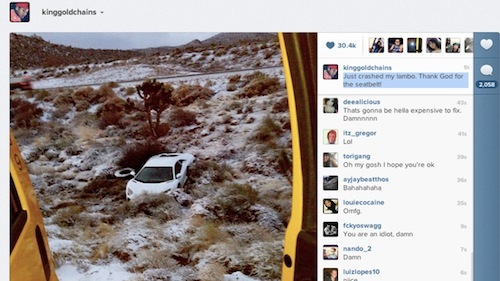 Tyga did not disclose the details of the crash, but the photo indicates that his white Lamborghini traveled off road and traversed over dessert terrain, before finally coming to a stop. There does not appear to be extensive damage to the sports car’s exterior, although its undercarriage will likely need some repairs. Aside from his Lamborghini, Tyga also owns a customized one-off gold Audi R8 two-seater, which was built by Roadstarr Motorsports. The golden R8 coincides with the rapper’s love for all things gold, which includes his gold tour bus and gold album cover for Careless World: Rise of the Last King. Furthermore, Tyga’s Instagram screen name is King Gold Chains. The entertainer’s gold Audi R8 was detailed in June 2012 issue of DUB, a magazine that covers urban custom car culture and features celebrities and their cars. Tyga also revealed his love for his Rolls-Royce Drophead Phantom in the interview. Interestingly, Tyga dismissed the idea of ever buying a Lamborghini in the June interview. The rapper revealed that his dream was to own a Lamborghini, but decided against it once he had the means to purchase it. Tyga claimed that the Italian sports car did not suit his style and was overhyped because “Everybody has a Lamborghini nowadays.” It's not evident when exactly Tyga purchased his Lamborghini, but the rapper obviously had a change of heart since the DUB interview. Tyga first gained attention in 2008 with his single “Coconut Juice” off of his debut album No Introduction. Following the success of his independent label debut, Tyga signed with Young Money Entertainment, a subsidiary of Cash Money Records and Universal Music Group. Tyga’s 2012 release Careless World: Rise of the Last King included several hit singles: “Faded,” “Far Away,” “Make It Nasty” and “Rack City.” Tyga currently plans to release his third album entitled Hotel California early next year. Just look at how far off the road he is and how little vegetative damage there is and you can see what happened: driving way too fast, lost control, Dukes of Hazzard off the corner and into the brush.